Today we’d like to introduce you to Patricia Aguilar. You might call my story “From big beginnings, small business happens.” Starting my career working in the big leagues, with MARVEL, McDonald’s and Big Pharma, I’ve come full circle with my life’s work now devoted to elevating small businesses. I believe small business doesn’t mean playing small or playing alone. That’s FourStar Branding’s purpose. I’ve always loved to experience and understand challenges. That’s why multi-tasking became my best friend from the start—juggling a full-time job at a CPA firm while pursuing an advertising degree at Columbia College. One day, we had a visiting guest speaker, an account executive from Frankel & Company the largest promotion agency in the nation. Chatting with the presenter afterward, she noted my interest in graphic design and suggested I apply there. Boom! My production career was born. Passionate about design and hard work, I was assigned to the McDonald’s account. I’ll never forget the impact working with such talented and dedicated teams had on me. The lessons I learned while helping market one of the most visible and renowned brands on the planet—understanding and listening to your client—still resonate 30 years later. After a great run at Frankel, new opportunities arose when my husband Tom was hired by former NBA Commissioner David Stern to head the National Basketball Association’s creative services department. 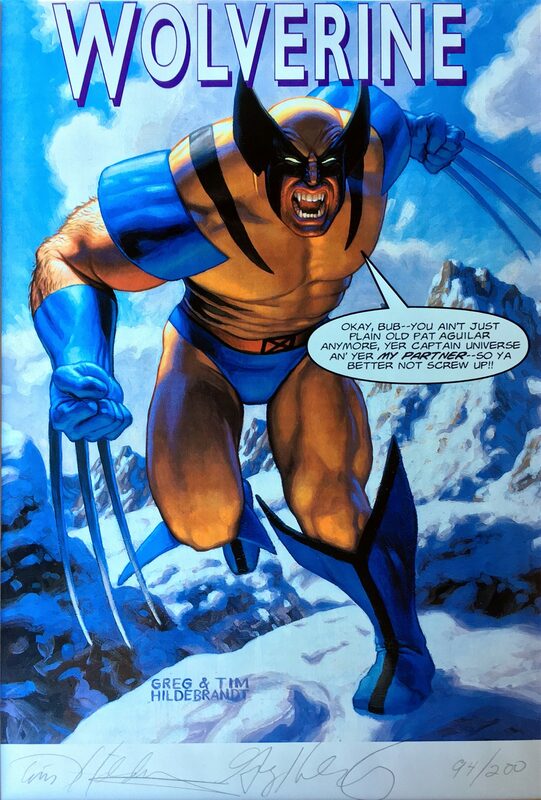 From Frankel to Marvel, my next move was to join McCann-Erickson’s pharmaceutical agency, Torre Lazar. 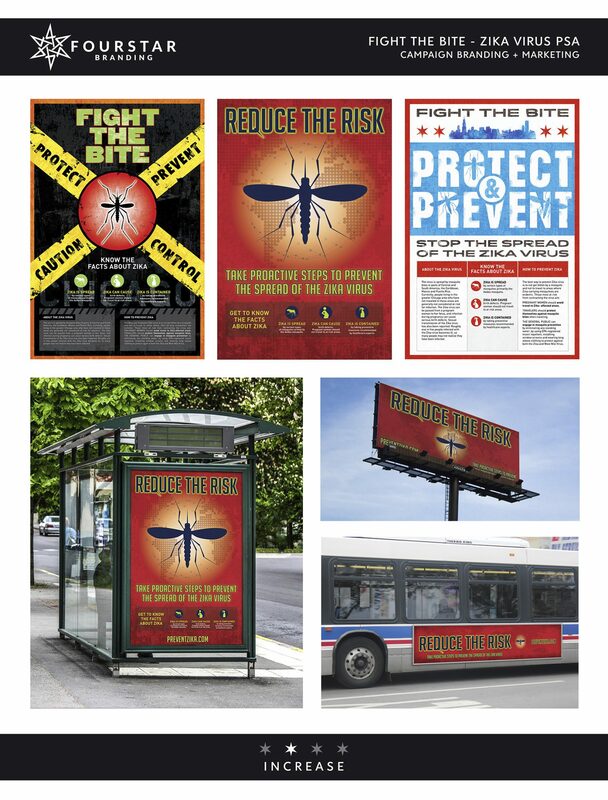 I supervised major product launches for Novartis, GlaxoSmithKline and Eisai Company with yet another talented, driven, and innovative creative group. From there, I was hired by one of the top pharmaceutical companies, Pharmacia (Pfizer) and spent three fantastic years working with amazing colleagues in Bedminster, NJ. After 13 years on the East Coast, Tom and I felt we were missing a piece of our puzzle—our family, friends and Sweet Home Chicago. 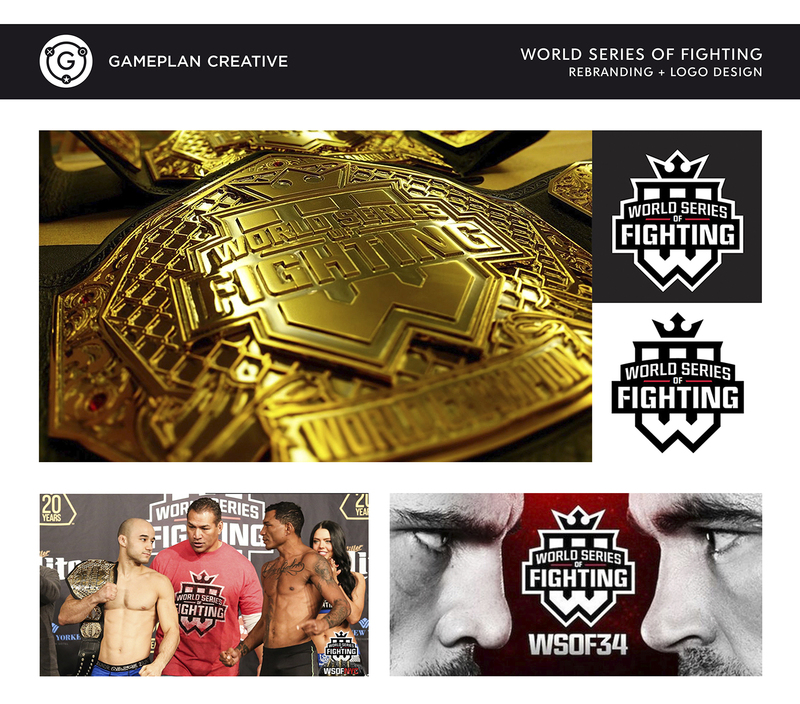 Together, we got the entrepreneur bug and made the decision to partner up to form a truly innovative sport and entertainment-based agency called Gameplan Creative. 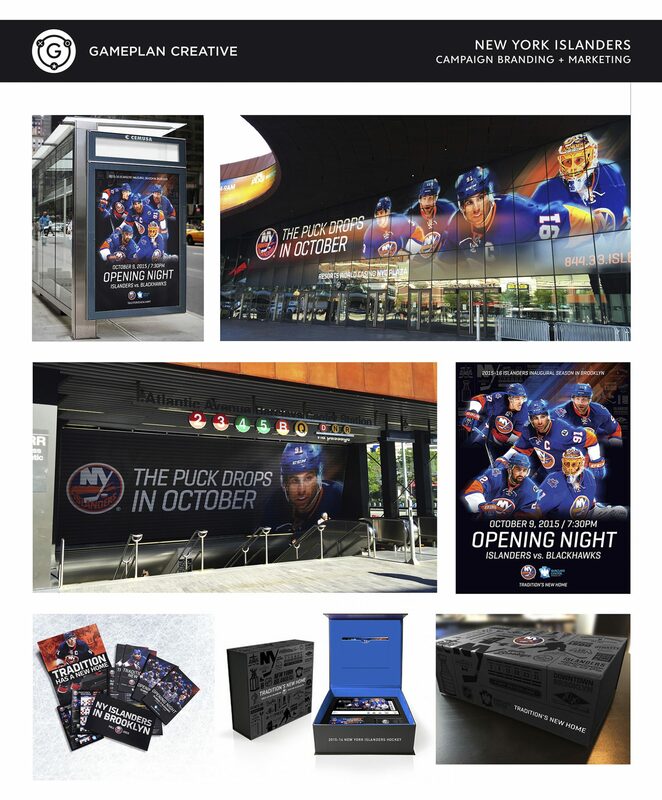 Back in Chicago, our unique backgrounds and experiences produced 15 years (and running) of Building Better Brands for major sports properties such as Major League Baseball, New York Islanders, New York Jets, the Chicago Blackhawks, Chicago Cubs and Chicago Fire sports teams. 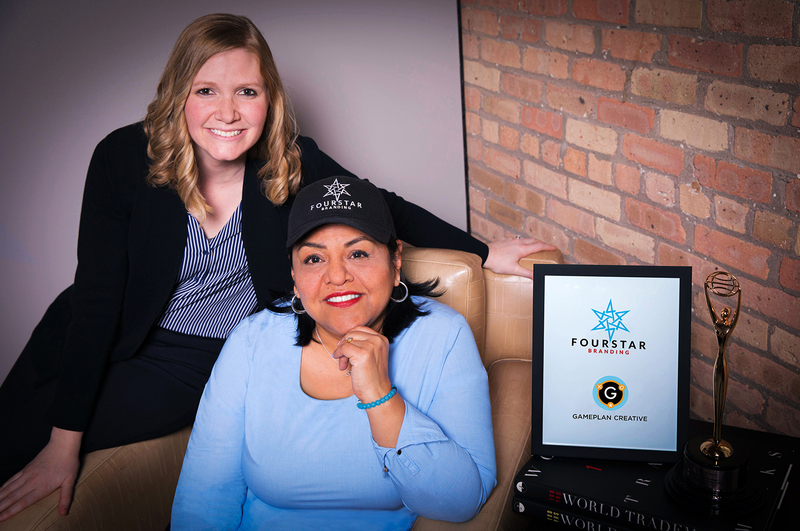 As a veteran of our 15-year entrepreneurship, I am both excited and proud to introduce FourStar Branding. Through it, blue-chip creative services will now be offered and level the playing field for small businesses and non-profits wanting to make a real difference in our communities. We think small business enterprises should have the same access to strategic and targeted brand consulting that Fortune 500 companies utilize. 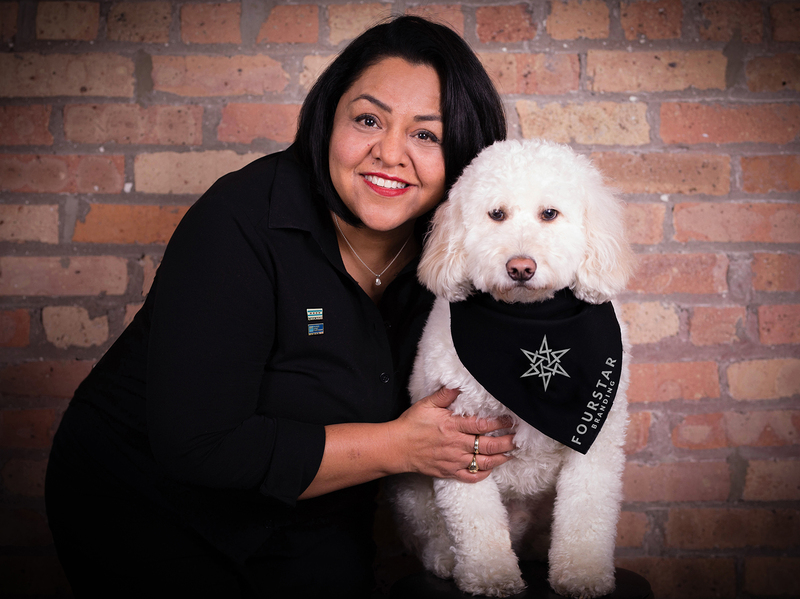 The name FourStar Branding was inspired by the four stars in the City Flag of Chicago. 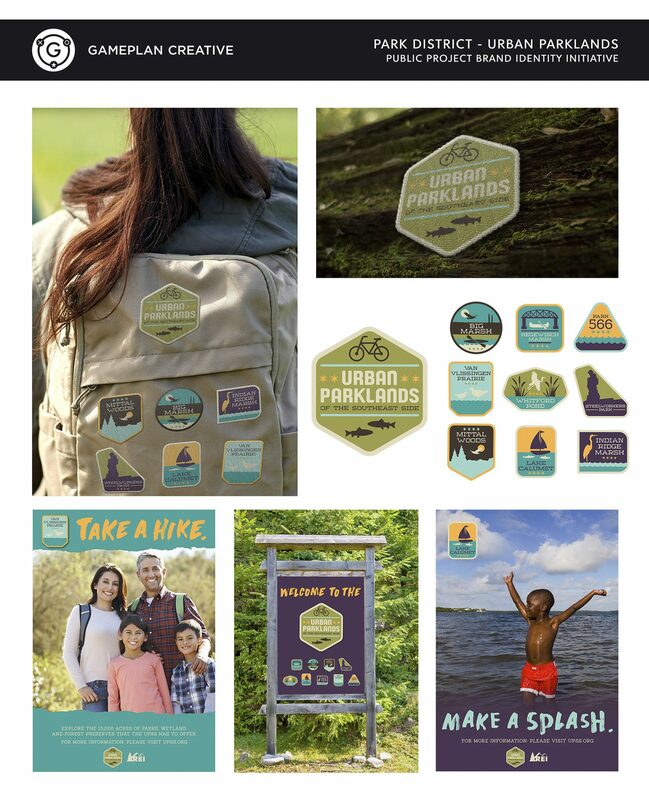 For us, the stars represent four key branding pillars: Ignite, Increase, Empower, and Promote—taking small business enterprise to the next level. 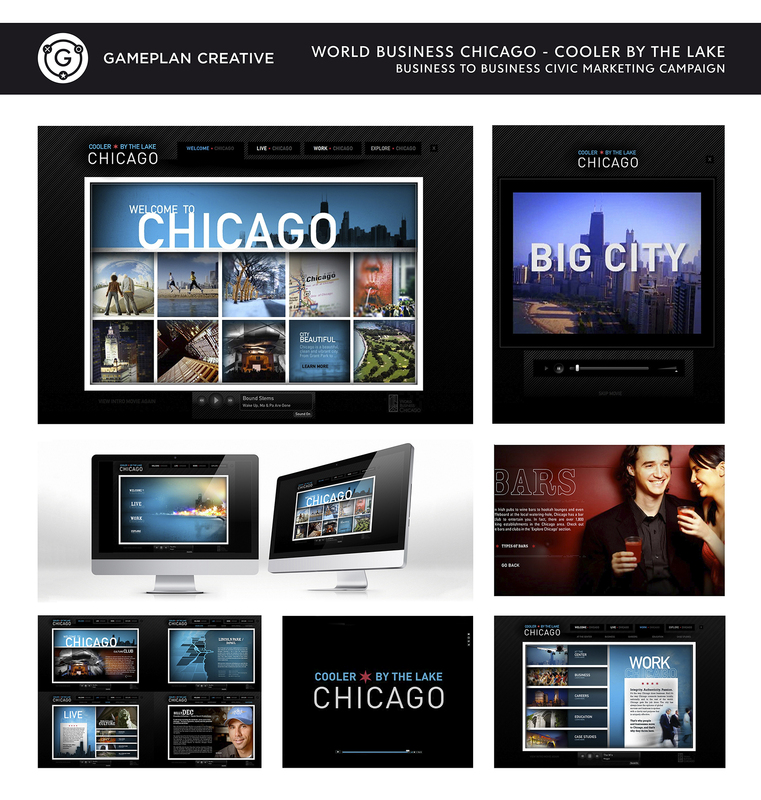 Comprised of a team of native Chicagoans, we are small business owners who live, work and breathe the concept. As a woman, minority, and mother, balancing life’s challenges have always been part of my DNA. My hard work ethic and family have been my go-to in overcoming all hurdles and struggles life has thrown my way. Both have inspired my life motto: Work hard and when life gets in the way—work twice as hard. My desire to learn, to explore, and my creativity were key skills to advancement in a male-dominated print industry, obtaining a Bachelor’s Degree, and co-founding Gameplan Creative while expecting the birth of our son, Paul Wrigley. I can remember a funny instance around the time I was pregnant while balancing work and school full-time. It happened during my final class at Roosevelt University. My professor looked over to me and announced to the class, “Patricia can present her final project, and then she can go home because her baby is most certainly on its’ way.” Honestly, my family and business associates supported me wholeheartedly throughout the entire balancing act. My determination with entrepreneurship is no different. I always look for new opportunities to expand my knowledge of how to best succeed in small business. It’s led me to apply and be chosen (from a highly-competitive pool) to participate in the 10,000 Small Business Goldman Sachs Program at the City Colleges of Chicago. As a life-altering professional and personal experience, it offered the practical business Babson education, capital, technical assistance, plus a supportive and accountable alumni network (Cohort 9 rocks!). Over the span of 20 exhilarating and exhausting weeks, I received the 10K Small Business Goldman Sachs Certificate of Entrepreneurship Studies. While difficult, having completed this rigorous program provided a sense of renewed confidence and invaluable knowledge. After all, that’s how we entrepreneurs succeed. Work hard—play hard. 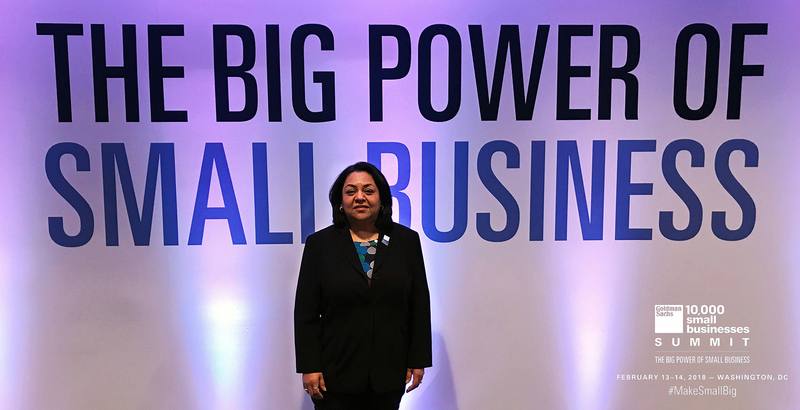 In February I was honored to attend the first-ever 10,000 Small Businesses Summit in Washington, DC. Goldman Sachs invited alumni from across the country to attend a 2-day entrepreneurial summit including distinguished speakers and packed with breakout sessions, workshops, congressional meetings, plus the marketplace reception at Union Station. One of many inspirational quotes from the summit was from Michael Bloomberg, Founder, Bloomberg LP and Bloomberg Philanthropies. “In America, you have a chance to start again, that’s what really makes America a great place for businesses.” That concept outlines what I want to do and inspires our FourStar Branding business. So, as you know, we’re impressed with FourStar Branding – tell our readers more, for example what you’re most proud of as a company and what sets you apart from others. 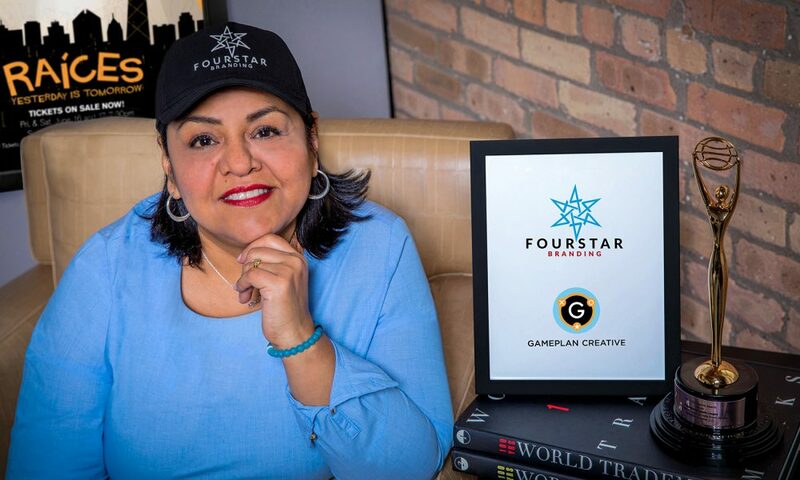 As a co-founder of Gameplan Creative, the launch of FourStar Branding fills me with pride as we move to empower small businesses with marketing solutions that increase revenue growth, brand recognition, and market presence. And we believe in doing so at an affordable investment that small business owners can sustain. It’s really important to our mission and our clients. 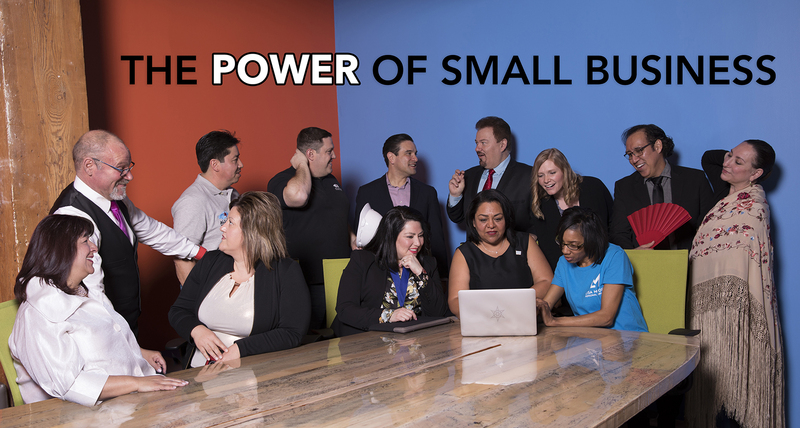 Showcasing our “Power of Small Businesses”—ranging from a start-up to an established 24-year firm, we’d like to share our Chicago small business success stories. 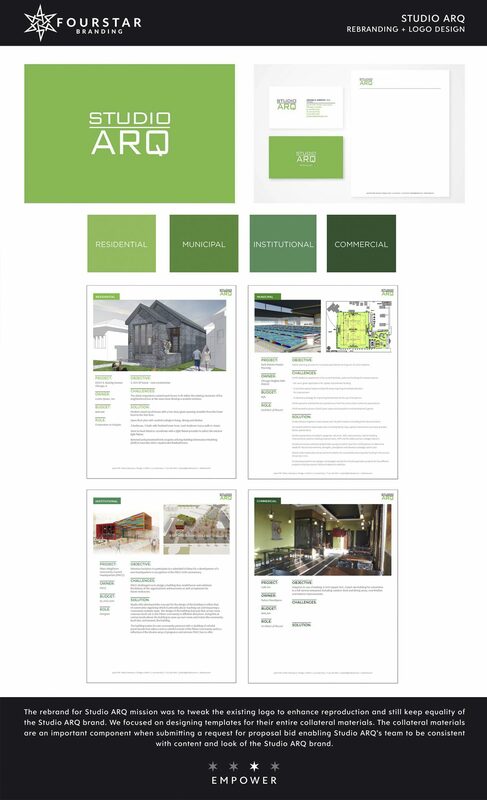 Please view our FourStar case studies in the footer of this article. FARO Associates Brand & Marketing for financial industry: “With FourStar Branding’s help, we feel confident that FARO’s branding is at par with that of Fortune 500 companies. It makes all the difference when we present to clients and prospects. Thank you for equalizing the playing field for us!” Olga Camargo – CEO & Founder. 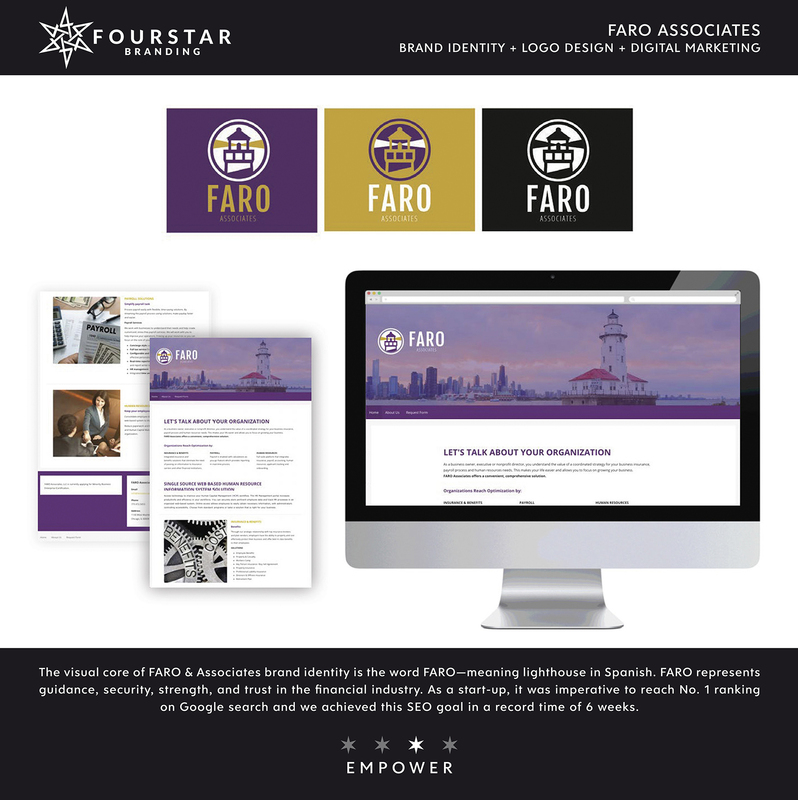 FARO Associates LLC “FARO” is woman-owned and is certified by the State of IL Department of Central Management Services as a Minority Owned Business. FARO provides access to a fully bundled integrated program that combines clients’ business insurance, employee benefits, and payroll information into a single platform, avoiding problems associated with transferring data for businesses and nonprofits, across industries such as education, construction, and healthcare. FARO Navigates Your Financial Strategies. Studio ARQ Brand & Marketing for Architectural industry: “Our branding reflects the growth and maturity of our company and will attract new prospects and new talent.” Cesar A. Santoy, Principal AIA, LEED. Studio ARQ is a full-service architectural firm specializing in commercial, residential and institutional design, owner representation, and design-build services. Studio ARQ manages administrative and paperwork tasks so their clients don’t have to. Studio ARQ portfolio offers project planning, capital grant administration, and project management services. 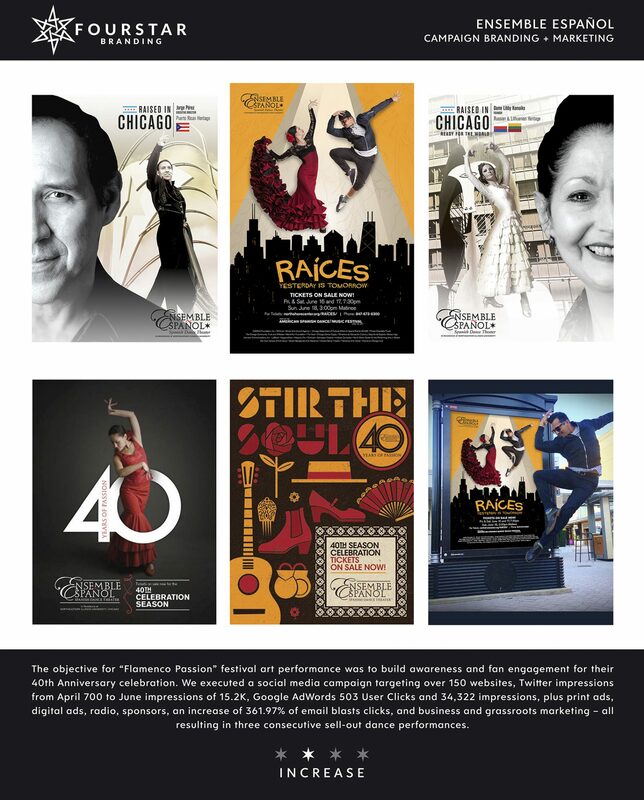 Ensemble Español Spanish Dance Theater in residence with the Northeastern Illinois University for the non-profit entertainment industry: “We continue to look forward to FourStar Branding’s support in helping us create and deliver our message of arts and education to the national and international communities we serve. Their expertise will help businesses grow, brand, and compete in today’s global market.” Jorge Perez, Executive Director. The Ensemble Español is the premier Spanish dance company in the U.S. to have in-residence status at a university Northeastern Illinois University, Chicago. The company, founded by Dame Libby Komaiko in 1976, tours nationally and internationally, providing an extensive arts education outreach to over 32,000 students annually. The center maintains an arts education program offering university-level dance courses for college credit. Environmental Analysis for the environmental industry: “If you build a great experience, customers tell each other about that. Word of mouth is very powerful. A logo is the company’s graphic representation. 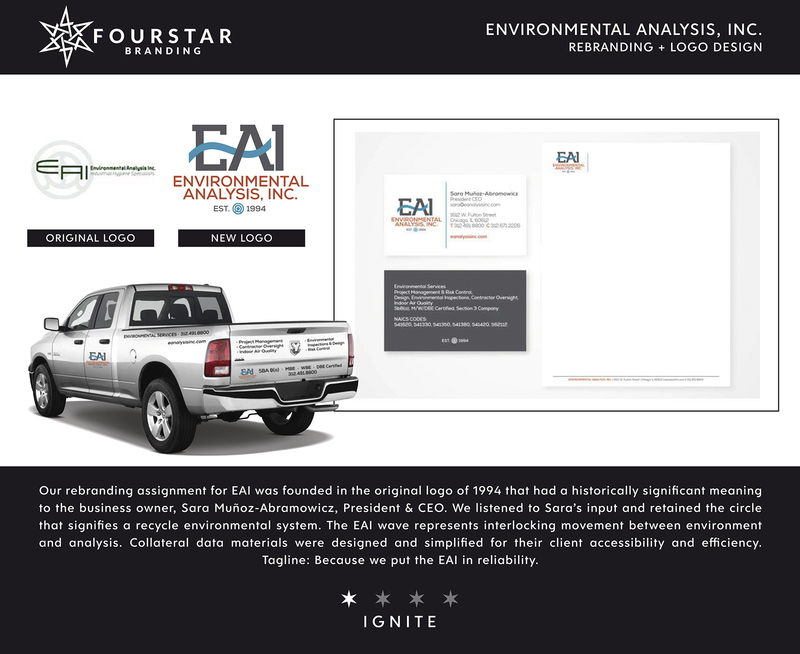 Environmental Analysis, Inc. is confident that working with FourStar Branding has given EAI a professional logo that anchors its company brand and becomes the single most visible manifestation of the company within its target market.” Sara Munoz-Abramowicz, President & CEO. Because we put the EAI in reliability. EAI is an Environmental Consulting firm that is a Certified Hispanic Minority Business Enterprise (MBE) and Certified Woman Business Enterprise (WBE). EAI’s greatest strength is the experience of its personnel with proven ability to perform environmental services for commercial, industrial, and public-sector projects. EAI performs comprehensive environmental building surveys, planned renovation inspection activities, creates a thorough design package, and bid documentation that’s vital for a successfully executed project. 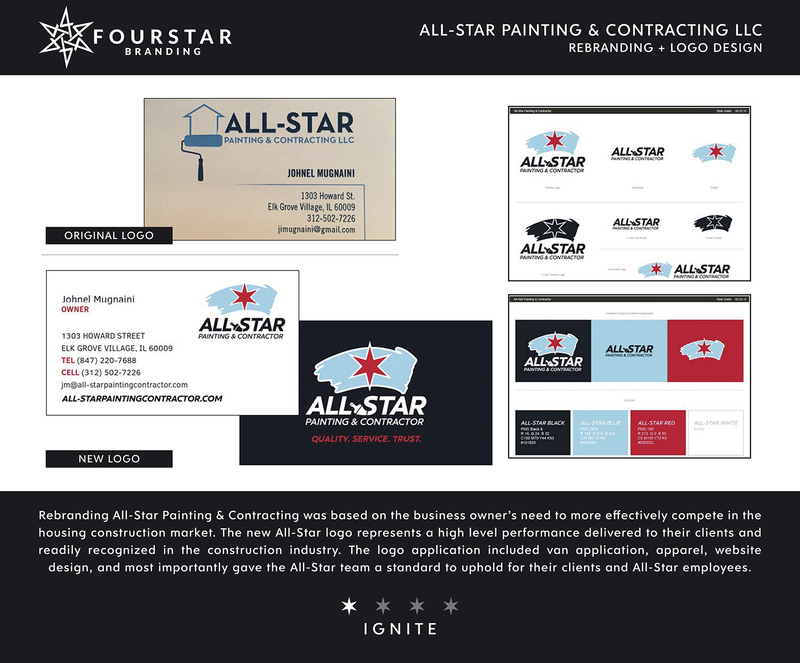 All-Star Painting & Contracting for the construction industry: “FourStar Branding breathed life into our business. They gave us an identity to move our business to the next level.” Johnel Mugnaini and Rafael Rivera, Owners. All Star Painting & Contractor LLC has been providing Chicago and the surrounding areas with exceptional residential and commercial painting services since 2006. The company offers superb painting services and complete quality renovations and remodeling services. All Star Painting is dedicated to creating beautiful, efficient and functional environments at affordable rates with exceptional craftsmanship. 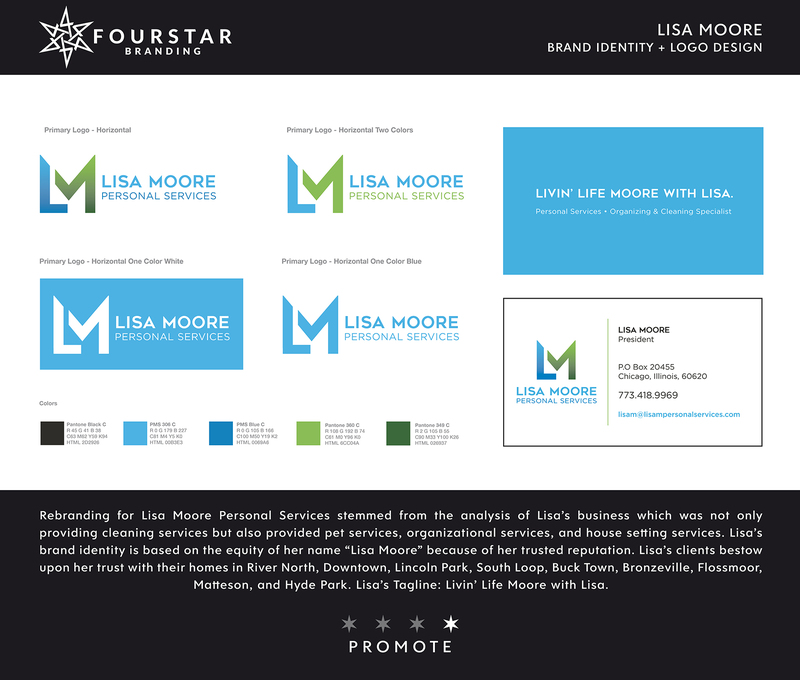 Lisa Moore Personal Services for personal service industry: “My new brand identity “Lisa Moore Personal Services” communicates expansion of our personal services, which in turn increases our revenue.” Lisa Moore, Owner and Founder. Lisa Moore Personal Services provides personal services such as cleaning specialist, organizational specialist, and pet sitter in the Chicagoland area since 2004. Lisa Moore provides exceptional customer service resulting in an everlasting relationship with her clients. Livin’ Life MOORE with Lisa. We’re here to change the game. 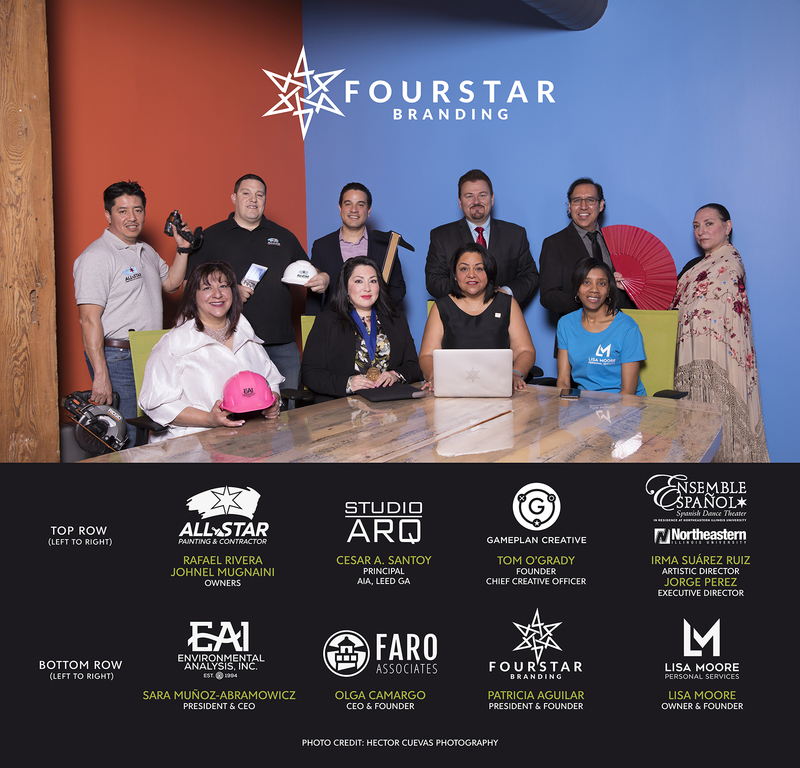 FourStar Branding exists for the future of small businesses. We are seeking partnerships with Fortune 500 companies in order to provide needed branding and marketing services to their existing small business customers. 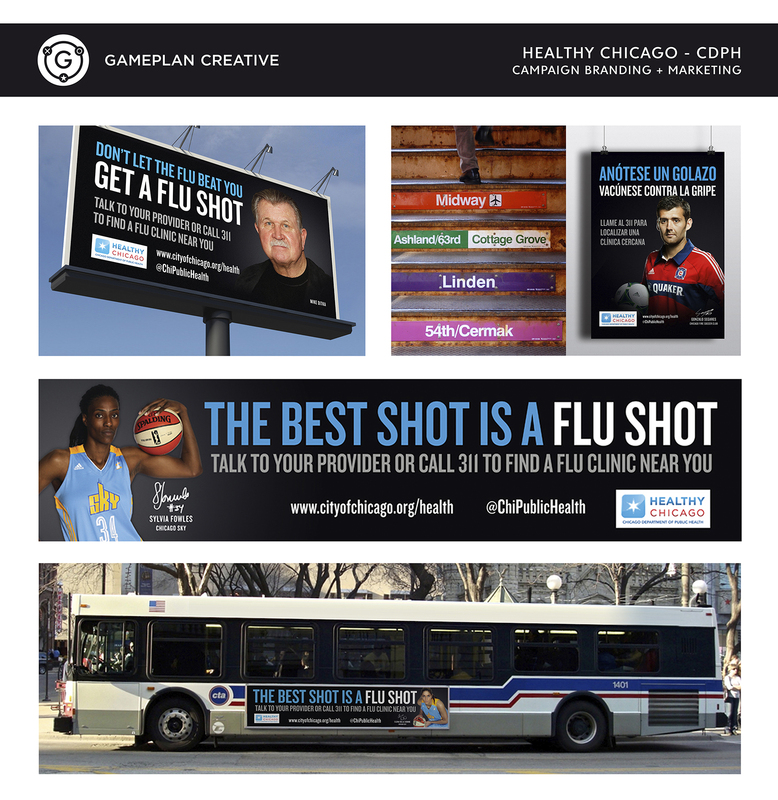 In this way, we’ll be serving a high volume of customers at a competitive rate—producing the biggest positive impact on Chicago’s communities through our FourStar non-profit branding grant. Along with strategically allied partners, we plan on propelling small business and social responsibility forward. We know through experience how difficult it is to allocate small business and non-profit marketing budgets toward quality branding efforts. That’s why we invest a percentage of our profits toward funding these non-profit challenges, which in turn enables our non-profits customers to retain budgetary resources used for supporting their community initiatives. Speaking of positive impacts, I do need to thank the Illinois Hispanic Chamber of Commerce, Kelley Francis, Vice President Corporate Relations for the introduction of the University of Illinois at Urbana-Champaign “Illinois Business in Action Program” and Silvia Bonilla, Director of Small Business Development Center Americas SBDC of Illinois. Big props also go out to 1871, named the #1 University-Affiliated Incubator in the world by UBI, for allowing me to mentor and help aspiring entrepreneurs that also continue to inspire our entrepreneurial spirit. From the earliest of memories, my dad was teaching my sister and me to learn and speak Spanish at home. Because we traveled throughout Mexico during our summer breaks, my dad was adamant we would be able to communicate with our relatives and community. As a professional, I had the honor to work and utilize my Spanish language skills for the production of the 1992 Universal Exposition of Seville with the distinguished graphic artist Javier Romero in Madrid, Spain. Olé! My dad’s insistence instilled in us a deep love of our beautiful Mexican heritage with all its customs, music, arts, and culinary magic. This immense appreciation of culture has continued with my son Paul Wrigley—who has quite a diverse cultural background. He eagerly celebrates Mexican, Polish, Irish, and German customs, languages, and music in our great City of Chicago.